"Innovative solutions for green infrastructure offer a more sustainable stormwater and groundwater management solution while also satisfying the city’s creative placemaking and financing goals. This approach would also alleviate the city’s current pump system, which is costly to install, operate, and maintain and contributes to water contamination. “It’s widely known that Miami Beach slopes from beach to bay,” says [Walter Meyer, founding principal of Local Office Landscape Architecture]. 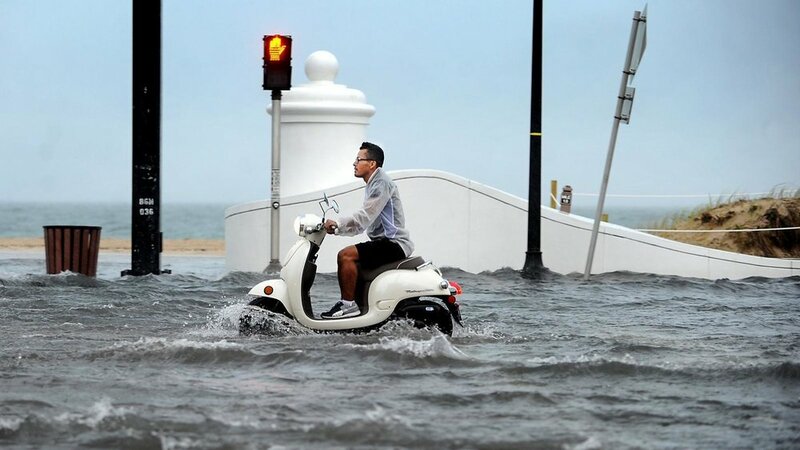 “The center of Miami Beach is at a lower elevation than its beach and bay sides, which creates a ‘bowl’ within the island that creates flooding situations. Instead, Meyer recommends, the city can use this basin as a ‘sponge’ for water management, using open space as storage and installing a wind-resistant tree grid system that allows this green infrastructure to absorb groundwater. Proposing that the city purchase land parcels for redevelopment, the city would develop open space to accommodate this infrastructure, while developing residential multifamily properties on parcels facing this open space. These housing units would allow the city to create a financing mechanism for the installation and maintenance of this infrastructure." “Green roofs are increasingly used as a sustainable urban drainage system due to their positive impact on the storm water management. The mitigation consists in reducing the total outflow volume, while delaying the initial time of runoff and distributing the outflow over a longer time period. The retention, detention, and infiltration processes promote the occurrence of adsorption and dissolution mechanisms throughout the green roof components generally limiting the total pollutant mass delivered on an event basis." Resiliency is the capacity of individuals, communities, and institutions, businesses and systems within a city to survive, adapt, and grow no matter what kinds of chronic stresses and acute shocks they experience. Resilience planning is about making a city better, in both good times and bad, for the benefit of all its residents and visitors, particularly the poor and vulnerable. In addition to having a dedicated resiliency team, the City of Miami Beach joined the 100 Resilient Cities network through a unique collaboration among Miami-Dade County and City of Miami. This collaboration came to be known as Greater Miami and the Beaches (GM&B) and was created to respond to trends major metropolis’ face: urbanization, globalization, and climate change, among others.